Do you need some ideas as you plan your Thanksgiving menu? Well, here are four hundred-year-old menus that might provide some inspiration. Seems like coffee was definitely going to be served. Though there’s no mention of tea. I wonder if tea was not as popular back then as what it is now. It’s interesting to note what’s on the menu not only for what’s on it, but what isn’t. The authoris of these menus didn’t necessarily think that you had to have turkey. Indeed, turkey is only on one of the menus. “Roast fowl” is on two of them. But what sort of fowl were they thinking of? Any fowl? Pheasant? And wine isn’t on the menu at all. I note that as if you spend any time watching the endless Thanksgiving shows that will now be appearing on the Food Channel, or whatever, they’re all going to have a part, or at least some surely will, where somebody talks about pairing wine with turkey (as they’re all going to feature turkey. . . which is okay as I like turkey). They’re all going to have pumpkin pie as well. . . which only one of these does. One of these, for that matter, has Maple Parfait. What’s that? I’m not surprised that there was no wine on the menus. This was the era right before prohibition. The 18th amendment was ratified in 1919, and prohibition went into effect in 1920. Based on what I’ve read, many people opposed the use of alcohol in the years leading up to prohibition. Very true. Indeed, people now like to imagine that there was a lot more opposition to Prohibition coming in than than there really was. In the 1910’s, many people really supported the idea of prohibition. I’ve seen numerous hundred-year-old newspaper and magazine articles opposing the “demon” alcohol. I think that once prohibition actually occurred, that public opinion began to change as the Roaring 20’s, speakeasies, etc. arrived on the scene. Indeed, in modern times my state has a reputation of being fairly open about alcohol, something that the leadership of the state has always tried to address (fairly successfully over the years), and people like to imagine that it was always that way. But it wasn’t. The state actually cast the deciding vote in favor of the Volstead Act and leading up to it all the newspapers were very much in favor of it. In 1918 the Saloon keepers association boycotted a summer parade over the issue and their place was taken right up by the Anti Saloon League which was somewhat celebrated by the papers. Prohibition had a lot of support. When Prohibition was repealed the sale of alcohol was stepped back in here over a period of years with the goal of keeping an unregulated “saloon trade” from reoccurring. That made quite a difference, I suspect, as the sale of alcohol was nearly completely unregulated prior to Prohibition but quite regulated thereafter. One thing that I really like about old newspapers, magazines, and books is that you can see how people actually perceived and framed things back then. Something is often lost when modern historians write about past events. I wonder about those ‘half-cups’ of coffee. You need more than a half-cup with dessert — except that the desserts seem a little slim, too. Thanksgiving means pumpkin pie, but it also means pecan pie, and a fruit pie like the apple, and plenty of whipped cream and ice cream. Some years ago, several of us discovered none of us was that fond of turkey, except for the leftovers. The solution? Two meats — perhaps an herb-crusted pork loin, and a small roasted turkey breast from the local meat market. Just right! I also found it fascinating that two of the menus listed “half-cups coffee” and the other two just said “coffee.” How did they decide when it was appropriate to serve a half-cup instead of a full cup. You’re right – The desserts do seem a bit sparse. Not sure why. Oh! I wonder if they meant demi-tasse – perhaps a stronger coffee like espresso? Indeed, while I never drink coffee after the morning, I don’t think I ever pour a half cup intentionally. I do recall that it used to be the case when my folks or my father’s siblings had dinners, like Thanksgiving Dinner, coffee was always served with desert. I haven’t done that myself maybe ever. It fascinating how things like when coffee is served have changed over time. I can also remember when people often served coffee at dinner – now I seldom see coffee offered in the evening. Crumbs. If you waded through that lot, you’d need more than half a cup of coffee, surely? The half cups of coffee were more than likely referring to demitasse cups of coffee which were served after a large dinner; not only were the cups small, they were traditionally only filled half full. Not sure why! That makes sense. I’d forgotten about demitasse cups. I wonder if the coffee was really strong back then. That might be a reason for the smaller serving size. It is all relative, isn’t it? By today’s standards what was “strong” back then might be medium roast coffee shop today! I think that they often used percolators to make coffee back then. I’m not sure how the strength of percolated coffee compares with coffee made with automatic drip coffee makers. I’m not sure either Sheryl, but I know that I absolutely loved that coffee my mother made with her percolators! Thank you for posting. I was wondering about the half cups too. Every menu is a feast. 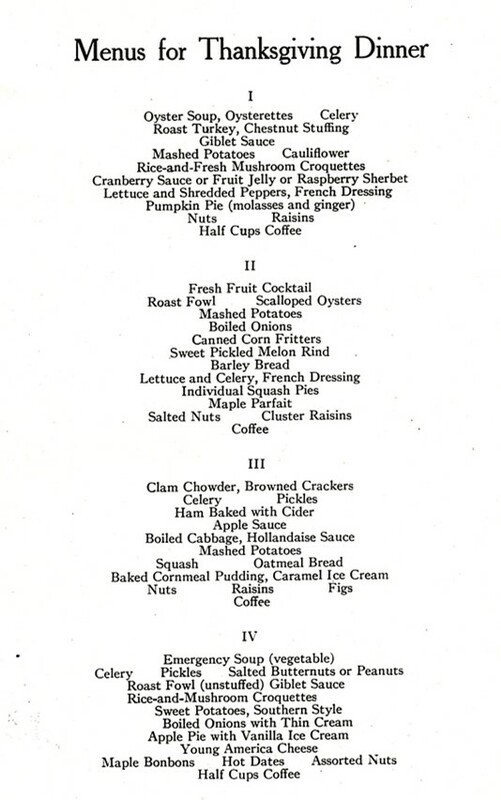 I found my Dad’s Thanksgiving menu from WWII Navy days and cigarettes were listed for dessert. Interesting – in a sad kind of way. Cigarettes were considered a real treat back then. It reminds me of someone from the Vietnam era who once told me that the soldiers really looked forward to breaks when they were provided with free cigarettes. and I am not sure how true it is, although probably is – back in Vietnam they received case loads of beer at the out posts. My son was discouraged that while in Afghanistan and Bosnia the tradition was beer as rewards. I am going to share this article, it is interesting to see how taste change over the years. I wonder if desserts are not in abundance like now perhaps the cost of ingredients too high or they did not focus too much on dessert just on the main meal? I don’t know…we don’t focus on dessert although out of tradition normally have pumpkin pie…daughter this year making a Christmas cake to kick off the Christmas season instead of pumpkin pie. It’s nice to hear that you enjoyed this post. There are so many things to think about. Old cookbooks have lots of dessert recipes – but there may have been less of a focus on desserts back then. Christmas cake sounds like a fun dessert. Have a wonderful Thanksgiving! I like the idea of “emergency soup” but just what constitutes an emergency? What a fun name for a soup – though I have no clue what constituted an emergency. I’d forgotten that oysters and several varieties of pickles were important items in my family’s holiday dinners. Thanks for the reminder, Sheryl. Oyster stuffing is a staple of my inlaws Thanksgiving dinner, which I really like. Sometime I want to make a hundred-year-old recipe for oyster stuffing – but it probably won’t be this Thanksgiving. Maybe next year. You’re welcome. My family didn’t serve oysters at Thanksgiving, but we always had lots of pickles. Have a wonderful Thankgiving! I wonder if the ‘half-cups of coffee’ were referring to ‘demitasse’? You know, those fancy little cups and saucers that were stylish way back when. I haven’t had oyster stew in years. We always had it for Thanksgiving when my grandpa was alive. Fond memories of it. Many of those old demitasse cups are so delicate and beautiful. I also haven’t had oyster stew in years – though just thinking about it is making me hungry. I also thought of demitasse with the coffee. There are a lot of items on all of these menus, although the one I’d most like to try and haven’t is the oyster stuffing. What’s Emergency soup? Would like to know what their idea of this was. Often I do a raisin pie, as I’m not all the fond of pumpkin. I have no idea how southern-style sweet potatoes differ from other sweet potato dishes. I was hoping that you might know. 🙂 Your Thanksgiving menu sounds wonderful. I forgot John’s sister always served oyster soup to start our Thanksgiving feast. All the people who will be with us this year are watching what they eat. Among us are cancer survivors, heart patients, diabetics, and some who have victoriously lost a lot of weight. We will do without appetizers and will have only two desserts to choose from. Even though everyone talks about food at Thanksgiving, in my opinion, the best part of Thanksgiving is having the opportunity to spend the day with family and friends. I agree that people are the best part of Thanksgiving. It’s my favorite holiday because most people in the US celebrate it. You don’t have to be careful when talking about it, and you can be as enthusiastic as you like when wishing people a Happy Thanksgiving. I also like how Thanksgiving has not been commercialized like so many of the other holidays. I hadn’t thought of that. A bonus! Such a lovely variety on each menu. I would be happy to try any one of the menus. I agree – Each time I look at those menus, I notice additional foods that sound really good. Wow! That is an ambitious menu! They probably were planning for fairly large gatherings. It’s fun to imagine cooks a hundred years ago preparing these menus. I bet that they created beautiful tablescapes with centerpieces and lovely table linens. I was surprised to see how often celery was mentioned. My mother always served a relish tray that had stuffed celery and olives on it. One item that sounded particularly interesting was the rice and mushroom croquettes. For holiday meals, my family also always had a relish tray with celery and olives . . . and pickles. When browsing through hundred-year-old cookbooks, I see many more recipes that call for celery than what would be found in a modern cookbook. Today we can get almost any vegetable year round, but I’m guessing that celery was one of a relatively few vegetables that were readily available at a reasonable price in the late fall and winter back then. We still make the tray with celery and olives and pickles! I still make a relish tray with celery, carrots (and sometime green onions), but don’t usually include the olives and pickles. I’m not sure why I don’t include them all . . . maybe this year. In considering the “fowl” on these lists, one thing that later occurred to me is that food was much more local at the time. Piggly Wiggly was the first modern grocery store and it didn’t open until 1916 (see https://lexanteinternet.blogspot.com/2016/09/first-modern-grocery-store-opens-in.html ). I wonder how much of what we see on these recipes, which of course are for early fall (we haven’t come up to the date for 1918 Thanksgiving yet, as it was November 28), reflect what was locally available? I suppose its being pedantic, but I always like folks to know if I’ve linked them in somewhere. It’s wonderful to hear that this post provided an inspiration for several posts that you did.